Since we’re approaching the new year, it’s prediction time. This post is about emerging technology that I see making inroads in education, training, and informal learning by the end of 2012—Near Field Communication (NFC). NFC permits quick exchange of small amounts of data between mobile devices, personal computers, and smart objects. The technology allows wireless communications over a small distance (10 cm or almost 4 inches). In practice, this means that when a user brings an NFC-enabled device in proximity to an object containing an NFC-sensitive device (i.e., an NFC tag or another NFC-enabled device), the user can retrieve information about that object and in some cases, share information. Some examples of what NFC-enabled devices can do are shown in this video, “Parallel Lives” by Nokia. Despite the somewhat idealized nature of the video (which seems to imply that if you don’t have an NFC-enabled device you will wear bad hats, miss trains, be frowned at by your boss, and never see the movies you want to see) , the ability to use NFC devices in discovery and sharing activities is certainly of interest in education, training, and informal learning. A list of NFC phones can be found here. Note that an NFC phone or a “phone with NFC technology” isn’t necessarily fully NFC-enabled, so remember to make sure the device is capable of writing as well as reading information if that’s where your interest lies. The Google Nexus S, for example, is read-only. Currently, fully enabled devices are available only as trial versions in the U.S.
An NFC tag is essentially a printed circuit integrating an antenna and stored data which can be read by an NFC-enabled device. NFC tag encoders (tools that code the stored data) represent additional emerging technology that probably needs to become more user-friendly for more widespread adoption of NFC in instructional design applications. *Near term because they can be implemented with read-only devices. **Dependent on wider availability of NFC-enabled devices (i.e., read/write, peer-to-peer devices). NFC-enabled devices already have been used for educational applications. In one use case, NFC tagging was used to create a “smart poster” for the University of Córdoba (Spain), providing information about University faculty and services through the inclusion of multiple NFC tags in a poster format. 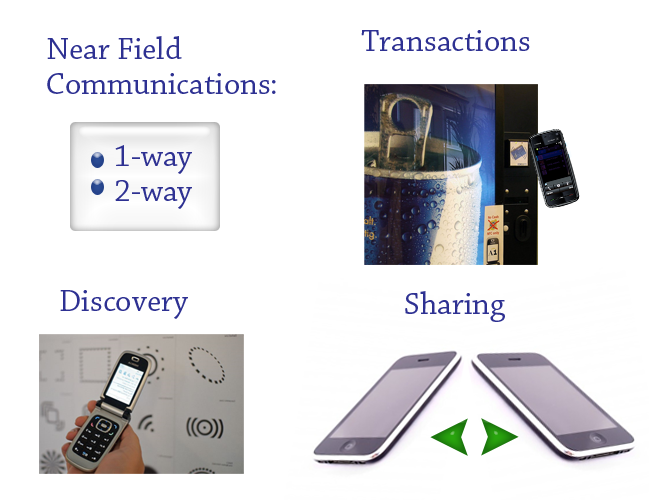 Users could pull information they needed by bringing their NFC-enabled device in proximity to zones of data associated with different NFC tags (Miraz, Ruiz, & Gómez-Nieto, 2009). In addition to allowing students to access information about faculty, degrees, courses, and research groups, students could wave their mobile at the poster to download a campus map. The smart poster also included a tag that permitted users to automatically request a ticket and make an appointment with a faculty secretary. Note that the transactional application (scheduling an appointment) isn’t something a poster that included multiple QR codes could automatically implement. Additionally, in contrast to QR codes, NFC tags are visually less obtrusive, which means that they can be integrated along with other graphic and content elements in a more seamless way (see Figure 2 in Miraz, Ruiz, & Gómez-Nieto, 2009). Launched on October 9 of this year, the Smart Muse project allowed teen visitors to the Centre Pompidou to wave an NFC-enabled devices (Wave-Me™ devices) at Wave-Me™ tags to access information in the museum and to share information with friends by touching their handsets together. The project was a result of a collaboration between Inside Contactless (now Inside Secure), ConnectThings, and Sagem Wireless. The Centre Pompidou’s video of the creation of the Smart Muse exhibit is shown here. Bottom line: If you’re interested in quick one-way information transfer and easy-to-generate codes, QR codes currently are your best bet. However, as NFC-enabled devices become more widely available and NFC tags become easier to customize, the power of two-way interactivity can be exploited to make mobile devices even better tools for collaboration and location-based learning activities. This entry was posted in elearning, informal learning, instructional design approaches, mlearning and tagged card emulation mode, Centre Pompidou NFC, ConnectThings, contactless communications, Google Nexus S, Inside Secure, InsideContactless, mobile learning, near field communication, near filed communication, Nexperts, NFC, NFC applications, NFC architecture, NFC definition, NFC education, NFC encoders, NFC FAQ, NFC forum, NFC generators, NFC informal learning, NFC mlearning, NFC payment, NFC phones, NFC smartphones, NFC tags, NFC ticketing, NFC Tool, NFC Tour Guide, NFC training, NFC writers, physical bookmarking, QR code applications, QR codes, read write NFC phones, RFID NFC, Sagem Wireless, Smart Muse, smart poster, smartphones, Tag Master, Tag Tool, Tag Tool Ericcson, Wave-Me tags, what is NFC. Bookmark the permalink.